The first version of this three-volume work was published in 1829 as a question-and-answer book of 80 pages. 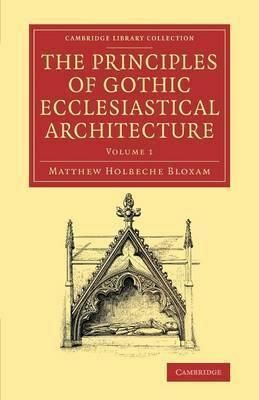 The eleventh, and definitive, 1882 edition of this hugely popular, highly illustrated work, reissued here, was published at the urging of Sir George Gilbert Scott, and consists of two volumes on Gothic ecclesiastical architecture and a 'companion' volume on church vestments. Matthew Holbeche Bloxam (1805-88), a solicitor by profession, was an enthusiastic architectural historian with a passion for churches. In the preface, as well as explaining his reasons for another edition, Bloxam records his concern that some features he had recorded fifty years earlier no longer exist: 'In the so-called restorations of ancient churches, not a few historical features ... have been ruthlessly, and in many cases needlessly, swept away.' Volume 1 surveys the rise, flowering, and decline of English Gothic architecture.